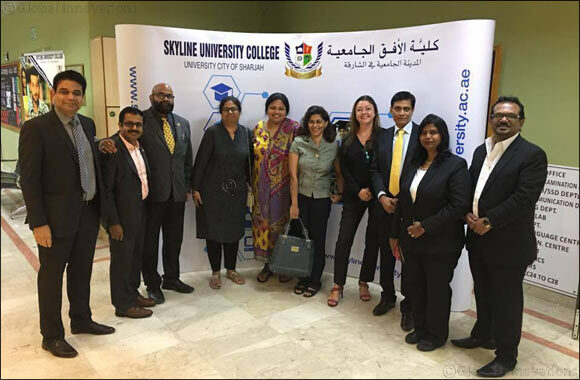 Dubai, UAE, October 4, 2017: Skyline University College (SUC) takes pride in joining hands with Toastmasters International (TM) to develop the soft skills of the students in professional grooming. The Toastmasters Club Freshmen Orientation was conducted on October 1, 2017, at SUC Multi-Purpose Hall mainly to introduce the club and its importance in developing the skills and potentials of SUC students. SUC Toastmasters Club has invited DTM Balaji Nagabhushan and his team for this collaboration to demonstrate the procedures and to emphasize the core values of the club which are integrity, respect, service, and excellence. The collaboration falls under PSDP (Professional Skills Development Program) which is SUC’s unique initiative to develop students’ professional skills in a methodical way. Toastmasters International is a renowned non-profit, global organization, known for transforming its members’ personality through sharpening their communication and presentation skills.